~ George MacDonald, A Dish of Orts. We are constantly reminded about the persistent certainty of change. This is a subject manifesting in such popular forms as our music and our aphorisms. All of that acknowledged wisdom still cannot completely convince us to count on the reliability of transition. A living human, body and soul, is in perpetual motion. As we live, we dwell upon moving surfaces. With a corner-of-the eye awareness, daily routines are repeated in a temporal context. The fluidity of time occurs to us when our continuities are disrupted. A building we always knew is torn down, a business we counted upon for years dissolves, people we long valued are suddenly absent, a protracted succession of work days or schooldays conclude. The passage of time bewilders and shocks. It’s as though time suddenly lurched forward, after a lengthy spell of stillness. But the hours and days have always been moving, all in the same increments. Yet there is ever an insistence upon solidity, upon predictability in the acknowledged provisional. The trick is to live a wise dynamic, even a comfortable one, in temporal conditions. The length and breadth of liminal space cannot be determined. Temporary can last a long time. As technologies continue evolving, more conveniences and tabulations are connected to our tasks. The mundane and transitory aspects of communication, travel, and commerce become increasingly easier, as well as increasingly monitored and measured. Popular corporate culture obsesses about fickle figures known as metrics. Ease and access are as phenomenal as they are potentially impersonal. The universality of immediacy is really incredible, such that a few undercurrents counteract, by seeking to “unplug” the pace. Recently, on a Boston-bound train, I sat across the aisle from a passenger with two restless young children. Trying to calm down the squirmier among them, the woman spoke in impressively adult tones, “now you need to be patient.” The child replied with a memorable, “but I don’ waaaaanna be patient!” Who does? But we have to be. If only the cherished could be held in place, and only the detriments be discarded. We would rather not view things and people we love as temporal. At the same time, we wince and want the things we dislike to go away fast- as in right now (this takes patience). All reside in the same time measurement, and unfortunately what we love is moving along and potentially away from us at the same rate as the unwelcome abiding of what we dislike. But then, we are each in motion, too. Evidently, I have something in common with the reluctant child on the train. A fond memory recalls a simple, yet memorably savory meal I had when I was 17. 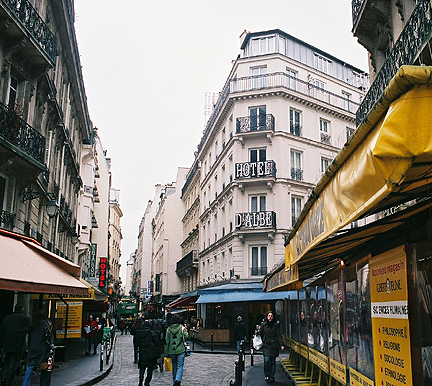 It was in Paris, and I had spent a day on one of my many photographing ventures. Realizing how hungry I was, I looked for an appealing eatery that I could afford. Stumbling into a little cavern appropriately called Le Clos des Bernardins, I saw that I had just enough money for a salad. Well, the waiter brought me a wide plate that was richly adorned with tomatoes, cucumbers, peppers, and vinaigrette on palm-like chicory greens arranged to point outward like sun rays. At the center of the salad was a warmed morsel of goat cheese. The colors, textures, and tastes were immediately striking, and I did all I could to eat civilly and slowly- albeit through tenacious hunger. I remember telling myself to savor this special food, and that I would momentarily stop to put down the silverware and look around the arched little dining room. I treasured every bite, and after gratefully paying the waiter what I had, I equally savored my slowed steps across the Latin Quarter. Even back then, I knew this was something to remember. What is purposed to last about a beautiful event cannot be the perishable ingredients, but rather the complete impression. Like flowers, a delectable meal is not meant to last. Amidst the temporal, there abides a universal thirst for permanence. I strongly doubt there is anyone that doesn’t wish for something in life to last forever. It could be a beloved person, a situation or place, or a slice of time preserved only by memory. I remember my 13-year-old self at the end of the summer camp season, being very sad at the prospect of leaving many new friends, and returning to the bad old city. A bigger kid put an arm on my shoulder, trying to console me. He was probably a ripe old 15, and he said, “come on, good times don’t last forever.” In retrospect, that’s a rather grim pronouncement for an adolescent to utter to another. But it’s also an acknowledgment of impermanence. Summers do inevitably wind down. We begin school so that we can graduate. The optimist’s comprehension is that there will be more good times to follow, and it’s good to expect them. Because of the work I’ve been doing for the better part of two decades, the word preservation is in my daily parlance. Archivists also want things to last forever. In my field, we use terms like permanence, longterm keeping, and conservation grade. We confer at length about best practices, formatted backups, and disaster preparedness. Of course, we must work to these ends; that is central to our professional stewardship and the common mission to preserve and provide access. We look ahead and we look back. Consider the historic materials and landmarks reaching us today from great spans of time ago. I type these words from atop the Boston Athenaeum, whose foundation dates back to the late 1600s. How will these places look, three centuries from now? Many of us, regardless of our work, have a personal awareness of preservation. The mindset says, “good things should last forever.” But we are striving to make things permanently endure in a temporal context. Our predecessors have passed their torches to us, and they may have also thought of the paradox of permanence in the provisional. We know that we do and see things that are momentary, but we proceed with a confident sense of preservation. How can there be rootedness in temporal times and places? Ideally, it begins with a sturdy sense of daring and a powerful imagination. It demands faith, the evidence of things unseen. There is a popular biblical passage about the dogged and daunted life of Jeremiah the Prophet. Perhaps he had an inkling that his was among the lives that would be associated with metaphors. There have been many such individuals across the centuries. The ancient Jeremiah was enjoined to invest all his personal resources into the purchase of property in enemy territory which was embroiled in conflict. It was a volatile war zone. But he did it, despite his second thoughts, because what loomed even more powerfully was that he needed to buy that field and make it bloom. There was a holy calling that haunted his thoughts that he follow his vocation. The alternative would have been even more costly to him, and those who knew him. There had to be solidity in the liminal. We say that we make permanent decisions, and that we establish ourselves and our investments. But at the same time, many of us keenly know that we are digging into moving platforms. Perhaps what we must do, in order to maintain sanity, is to prosper between the temporal and the permanent. What is substantial, to the point of solidity, is our treatment of the transitory. a meal in paris? sounds almost romantic, can't remember the last time I had a meal somewhere where I can remember what I ate and what my surrounding was so that must have been a great moment. hope you're enjoying the last few days of summer, have a lovely day. I would like to reproduce your notebook+pen+seascape photo on my own blog with credits to you and your blog. I plan to feature it next Wednesday. Is this OK with you? Thank you both, for reading and for your comments! Yes, Colin, that's fine. Go right ahead. I'll look forward to your essay! As I don't have an email address for you, my apologies for conducting this exchange in public as it were. And if you felt it could be included in your Kindred Blogs list, then you will make one old man very happy as his readership may soar above the present average of ten!